Alysson Storey has almost twenty years’ experience working in government, including close to a decade at the Municipality of Chatham-Kent. Alysson knows how to advocate successfully for important issues through her work lobbying for a concrete median barrier on Highway 401. She has an extensive network of business and government leaders across the country. She is a hardworking community advocate as Past President of the Rotary Club of Chatham. Alysson is a communications specialist and passionate about promoting the amazing assets we have in Chatham-Kent. She’s also a fiddler, flautist and vocalist in the Celtic band the Chatham-Kent Mountaineers and married to Dan Davidson from Tilbury East Township. Alysson is concerned about the major population and job loss our community is experiencing. She wants to use her expertise and experience to work with her fellow citizens to make Chatham-Kent’s future brighter than our past. Your vote for Alysson Storey is a vote for transformational change. It’s our time Chatham-Kent. For more information go to https://www.itstime4ck.com/, Twitter or Facebook. I was born at the Sydenham Campus, grew up in Wallaceburg and am now raising my family in my hometown. I have two beautiful and smart daughters: Ava, 13 and Daylia, 11. Together with the love of my life Dana, we run our business, the Sydenham Current online newspaper, out of our Wallaceburg home. Having been a journalist in Wallaceburg for 12-plus years, I’m now seeking a spot in Ward 5 to ensure Wallaceburg has continued and effective representation and leadership on Chatham-Kent Council. Council has an important responsibility to govern our community, set direction and look for ways to improve and maximize the potential of all of our communities – in the short-term and in the long-term. There are many areas/departments that will require our attention on a continual basis. I will always take the following approach to making decisions on behalf of Wallaceburg and addressing issues that arise: family-first, open-minded and balanced, professional, educated/informed, respectful, positive and utilizing a team mentality. I will work hard, do my research, listen to our residents and always do what is right for Wallaceburg. Anyone with questions can call/text me anytime at 519-365-1079 or email me at aaronwilliamhall@gmail.com. Raised in Wallaceburg Carmen has been actively involved within her community for many years. Her career path, political experience and community involvement has given her a diverse understanding of the needs within Wallaceburg and the communities of Chatham-Kent. She is married to Tom, they have 4 children and 8 grandchildren. Carmen’s priorities for the next term of Council are to work with the St. Clair Conservation Authority to change the water level criteria to activate the floodway operation. Work to better to educate our youth to the great jobs that exist locally so that they want to reside close to home after they have completed their education. Currently chairing the Infrastructure and Innovation committee she wants to continue her work to improve the infrastructure locally. As a Board of Health member, she wants to improve opportunities for the infrastructure needed to provide opportunities for citizens to achieve healthier lifestyles. For more information go to carmenmcgregor.ca or find her on Facebook @ Re-Elect Carmen McGregor, Ward 5, Wallaceburg. Randy McNeil is a candidate for council in Ward 5 Wallaceburg. Randy is a lifelong resident of Wallaceburg. A professional accountant with over 40 years experience working in the finance field working for several local companies in management positions. While working in industry Randy was also the co – owner of two local small and understands what the need of small business are. Randy is proud that he spent 9 years on the council in the former municipality of Wallaceburg during the amalgamation years. I believe that my voting record would show one of fiscal responsibility over those nine years. He has been involved in many organizations over the past 40 years and does so because as he says he “Believes in Community”. For more information go to www.facebook.com/Mic1954/. 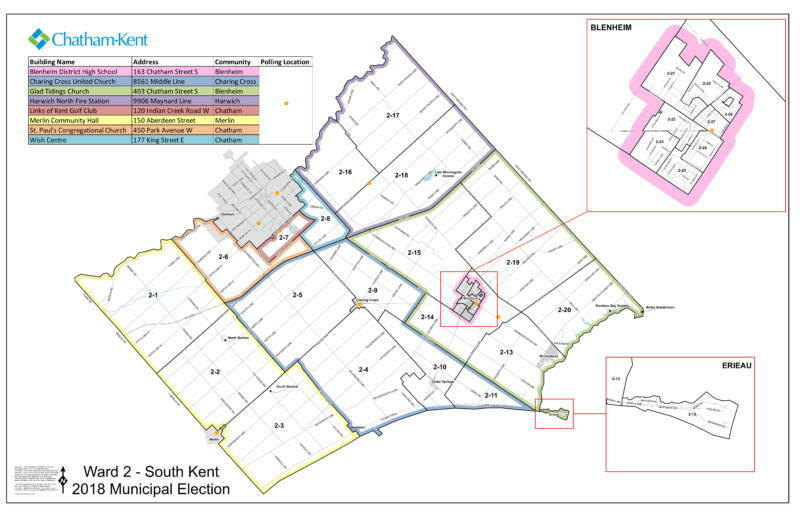 * All candidates who have filed their papers for the 2018 Chatham-Kent Election are listed in this space. Candidates that have additional information listed with their name have purchased an Election Advertising Package with the Sydenham Current. For more information contact Dana Haggith at dana@sydenhamcurrent.ca or 519-784-4610.